From fierce fighters with armor, sword & shield to ladies who do dainty embroidery, Nord Du Lac is a wondrous land filled with folk of courage, creativity & mirth. Here we eagerly explore all aspects of Western European culture & history from the period known as the Middle Ages (pre-17th century). We are a but a branch of the great tree known as The Society for Creative Anachronism, Inc. (SCA), a non-profit worldwide organization. Here thou shall find many fine folk, who, like thee, enjoy exploring, learning & teaching about, and recreating the Best of Europe's past. 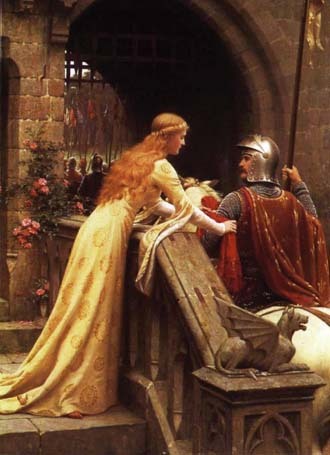 Our Society is populated with Kings & Queens, Princes & Princesses, Knights with their squires, Lords & Ladies, everyone from bards to merchants in fascinating array from Celts, to Vikings; from Gypsies to Elizabethans. Thou wilt see the pageantry of grand tournaments as in days of yore, where brave men set sword against sword. Our events, which are organized & run by our members, usually include classes, competitions & children's activities that are often followed by a Court of the Monarchs, candle lit period feast, bardic circles, drumming circles, & dancing. In Nord du Lac all areas of the arts & sciences are our domain from fencing, archery & other warrior sport to creating period style clothing; from coursing of the hounds to period cooking, brewing & vintning; from heraldry to herbology to medieval illumination & calligraphy. A list so long we can not speak it all, bounded only by imagination. Therefore ye shall find in addition to our monthly business meeting; monthly Arts & Sciences classes, Fighter, Archery & Fencing practice, socials & movie nights & a meeting of scribes called Scriptorium. Along with our local Tournaments, The SCA holds many "Wars," & we in Nord du Lac are blessed to have just such a popular & exciting event nearby. Gulf Wars is held yearly for one week in mid-March. Over 4000 members from many Kingdoms gather in Lumberton, MS to participate in mighty field battles & competitions, erect pavilions & establish encampments, dance & play music, attend classes, go a marketing at merchants row & much more. Every fall season within the borders of our lands magically appears from out o' the mists of time, Ye Royal Village of Albright in honor of Louisiana Renaissance Fair (Robert, LA). Come then, be not shy, join us in making merry in these, the current Middle Ages & experience all that Nord du Lac & The SCA has to offer thee. To learn more of our monthly meeting or our events explore our links above. If what thou seekest is not herein, then please contact our Chatelaine (Newcomers Guide) or our Seneschal (Chairperson) or any of the friendly folk of Nord du Lac who will most gladly assist thee further in thy quest. So that thou mayest find us, we are a group newly sprung forth from the grand Principality of Gleann Abhann in the majestic Kingdom of Meridies. As thou mayest see by our name, which means 'North of The Lake,' we are located north of the Great Lake of the Lady (Lake Pontchartrain, Louisiana), bordered on the south o'er the great treacherous lake & dreadful bridges lies the Barony of Axemoor (New Orleans, Louisiana), & on the west o'er the dangerous and dusty road by the fierce dragon ghost of the Shire of Wyrmgeist (Baton Rouge, Louisiana), & guarded on the east by the giant Sealion and her mighty gulf of the Barony of Seleone (Biloxi, Mississippi), & to our north protected by the Shire of Iron Ox (Jackson, MS) & the Shire of Dragon's Weal (Hattiesburg, MS). This is the recognized Web Page for the Incipient Shire of Nord du Lac of the Society for Creative Anachronism, Inc. The maintainer of this page is Deirdre Mansfield. This site may contain electronic versions of the group's governing documents. Any discrepancies between the electronic version of any information on this site and the printed version that is available from the originating office will be decided in favor of the printed version. Copyright © 2002 Nord du Lac. The original contributors retain the copyright of certain portions of this site. For information on using photographs, articles, or artwork from this website, please contact the web minister Deirdre Mansfield, who will assist you in contacting the original creator of the piece. Please respect the legal rights of our contributors.